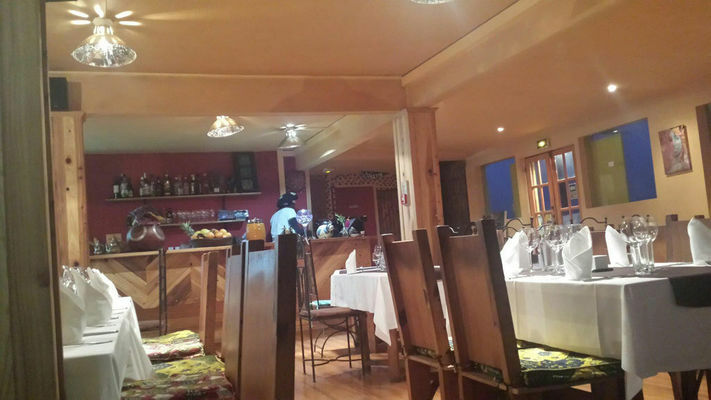 Le QG restaurant is located in Bourg-Murat in La Plaine des Cafres. Tasteful decoration, open fireplace and the works of art by Alain Béton (the restaurant's owner) all go to give it a warmly welcoming atmosphere. It serves Creole cuisine prepared over a wood fire , a range of sandwiches, wood-fire cooked pizzas, homemade bouchon dumplings, breakfast etc. Menu to eat in or take away. Wide choice of special rums (rhums arrangés). Open daily from 6:15 a.m. to 10 p.m. Seminar room seating up to 20 people. Access for people with reduced mobility. Environment / Access : From the South, take the dual carriageway to Le Tampon/Plaine des Cafres. When you get to the Tour des Azalées roundabout, take the road to Plaine des Cafres/Bourg-Murat. Turn right at the Maison du Volcan roundabout in the middle of the village. Continue straight on and then turn right again. The restaurant is on the right. From Les Plaines, follow the RN3. When you get to the middle of the Bourg-Murat village, take the 3rd exit. Continue straight on, then turn right again. The restaurant is on the right.